Gross to net lets you see what some amount would look like before the tax is/was applied or after it's been deducted. Gross to net calculator solves multiple different tax-related problems. The tax base issue might be a bit confusing, see the "gross vs net" section below for an explanation. 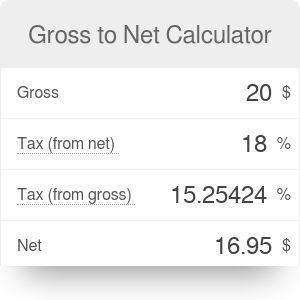 Net to gross is a nearly identical calculator, but with fields rearranged, so that some people might find it easier to grasp the difference between gross and net (sometimes we think in one direction and have a problem reversing the process). What's the difference between net and gross? The simplest answer would be "the gross amount includes a tax amount and the net amount doesn't". It's a bit tricky - in some cases we are talking about a gross value before the tax was deducted (income tax), in others - after the tax has been added (VAT, sales tax). These two calculator handle specific cases, even though they essentially perform the same calculation as gross to net calculator. It's important to know what's the base for the tax. For example, when we're talking about gross income vs net income, the tax is based on the gross value. If we earn $100 and the tax rate is 20%, we'd earn $80 net. The situation is different when we're dealing with VAT and sales tax. Then the tax amount is based on the net price. An example: a widget costs $80 net and we have 25% VAT on top of it. The tax is one-fourth of 80, which is $20. The gross price is then $100. In both cases the net price was $80 and the gross price was $100, but the tax was 25% in the former and 20% in the latter case. Gross to Net Calculator can be embedded on your website to enrich the content you wrote and make it easier for your visitors to understand your message.